The JLA will participate in the 4th annual Little Black Dress Initiative (LBDI) on October 22-26, 2018. Through this week, 102 LBDI Advocates wore the same black dress for five consecutive days to illustrate the effects poverty can have on a woman’s access to resources, her confidence, and professional opportunities. By wearing a button that reads “Ask me About my Dress,” Advocates invited dialogue among colleagues, friends, and strangers to raise awareness about generational poverty. 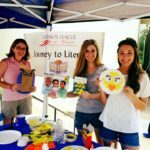 Journey to Literacy is a hands-on literacy program presented throughout the community. Developed by the JLA in 2009, Journey to Literacy helps raise awareness within the community on the importance of early childhood education and teach parents effective methods to develop and increase early literacy skills. The program is presented at local libraries and special events presented by community partners. 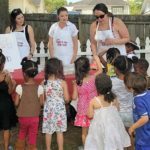 The JLA provides instructional and interactive events which empower youth to make healthy lifestyle choices to help fight the growth of childhood obesity and its associated negative health issues. Estrellitas (“Little Stars”) is a JLA program whose mission is to educate, empower, support and inspire young Latina girls by teaching them life skills and equipping them to be confident and good decision makers. This mentoring program consists of a series of workshops coordinated by JLA volunteers serving high school Latina girls. The JLA conducts drives on behalf of our community partners and distributes the supplies collected throughout the year. Past drives included collection of items such as children’s books, school supplies, clothing items, used household items and baby items. JLA Serves weekend was held on Friday, October 19th through Sunday, October 21st. JLA Serves is a wonderful event created to help league members rally together for three days of impactful service at fourteen community partners across the metro Atlanta area. In addition to direct community exposure, JLA Serves provides members with a fun volunteer experience, benefiting both the league and the community, as well as a chance to help brighten the lives of seniors, youth and others in need! We look forward to making a positive impact on the community for 2017-2018! Our incredible volunteer events are focused on the league’s initiatives on community engagement and service, early childhood education, and generational poverty. Community Sampler volunteers work with community partners on a one-time or periodic basis depending on the agency’s needs and volunteer’s schedule. This program is well-suited to partners that do not have the capacity or need to support volunteers year-round. 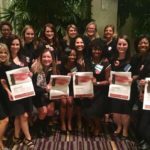 JLA sponsors two annual community awards – 11Alive Kids Who Care Awards and the JLA Empowerment Award. For over 30 years, JLA and 11Alive have joined together to honor five outstanding high school students with the Kids Who Care Award. The award recognizes the unselfish contributions of young people who are dedicated to making our community a better place. The JLA Empowerment Award is designed to honor and reward a client of a community agency who has overcome adversity to achieve self-sufficiency, as well as the agency who assisted her in the process. Both the individual and the agency receive a monetary prize and the individual receives a ‘prize package’ of goods and services donated by local businesses.